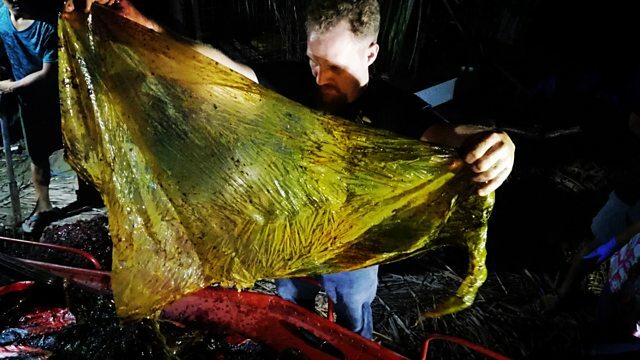 A dead whale has been found washed up in the Philippines with a stomach filled with 40kgs of plastic. Workers at D'Bone Collector Museum in Davao City recovered the body of the Cuvier's beaked whale, before making the discovery. They say the animal was filled with the most plastic they've ever seen in a whale, including 16 rice sacks and multiple shopping bags. Darrel Blatchley is the director of the museum and personally conducted the necropsy, an autopsy for animals. He told Radio 5 Live when they started to open the whale up, “plastic immediately started to spew out of it”. He said the sight was “appalling, disgusting and heart-breaking”, and brought his nine-year-old son to tears. Video from 5 Live Drive. Everything you need to know about climate change as part of 5 Live's Cool Planet season.